UFW Stories: "Cesar Chavez Youth Leadership Conference and Celebration now at UC Davis - Going Strong at 13th Year!" "Cesar Chavez Youth Leadership Conference and Celebration now at UC Davis - Going Strong at 13th Year!" I started a Youth Conference in honor of Cesar Chavez back in 2001 in Placer County at one of our Middle Schools in Roseville and later at Sierra College in Rocklin because the Education of our Youth was so important to Cesar. Now the 13th Annual Cesar Chavez Youth Leadership Conferene and Celebration is relocating to the University of California, Davis and will be on Saturday, April 13, 2013. It is free and open to all communities! Please read about below as this is how I am celebrating the marking of Cesar’s 20th year of passing. Que Vive Cesar Chavez! UC Davis, CA – Close to 500 elementary, middle and high school students will converge on the Cesar E. Chavez Youth Leadership Conference on Saturday, April 13, 2013 in Freeborn Hall at UC Davis. The conference will include an Arts, Education, Health and Job Fair. For over a decade, this event has provided guidance to youth seeking to pursue higher education and grant / scholarship information. This unique educational forum allows 6th to 12th grade students and their parents an opportunity to learn how to pursue secondary educational and grant opportunities. College recruiters will be available to answer student questions. There will also be information designed to empower families to become stronger advocates for their children’s education. From 12:30 pm to 2:55 pm, there will be a special program, “Embrace the Legacy of Cesar Chavez” lunchtime celebration and talent show. Performers include folkloric dancers, Aztec dancers, and trick roping cowboy and whip master James Barrera. There will also be carnita and vegetarian burritos for conference attendees to feast upon. There will also be a live theater presentation, “Nightmare on Puberty St.” by the Kaiser Educational Theater Program. That presentation begins at 9:30 am. The conference traditionally kicks off a series of Sacramento-area events related to California’s Cesar Chavez Holiday. Cesar Chavez was co-founder and president of the United Farm Workers (UFW) union. He led the union from the 1960s to his death at age 66 in 1993. The UFW was instrumental in organizing farm workers in several states. In 2000, Governor Gray Davis signed SB 984, asking that school districts give an hour of instruction in all schools around Chavez’s March 31 birthday. 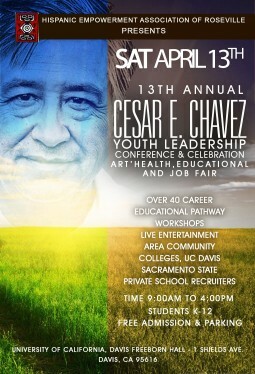 in 2014 - the Cesar Chavez Youth Leadership Conference and Celebration will be on March 15, 2014 at the same Uc Davis location. The youth conference continues to recognize the UFW founder’s lessons on non-violence, self-sacrifice and social justice. Students are encouraged to engage in some form of public service appropriate for their age and grade as part of the Cesar Chavez Day of Service of Learning.